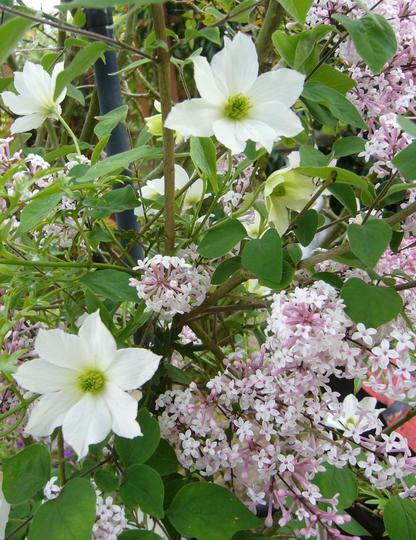 Sweet-scented lilac and clematis blend into a pretty bouquet. This lovely lilac started as a tiny cutting from a friend's shrub, and it has blossomed into a beautiful bush. This is absolutely beautiful TT. Brilliant combination. I wish you guys could smell the scent of this lilac. Each time I walk under the arch to my shed, I pause and sniff the flowers. Lol. TT...I was not born with the gift of hearing, or sight..But smell-I have been gifted with, and lilacs are one of the nicest smells in this entire world. As I child I would rob the lilacs of others...lol.. Your picture looks great, too! A beautifil combination TT , so pretty ! Lovely colour combination and that fragrance TT , well I suppose you were only a child Newfie ..probably known locally as the little lilac looter ..try saying that over a few drinks ! Sometimes the plants sort of put themselves together.... Lol. My lilies , most of the white ones, have died in the winter, got drowned and then frozen, I guess. So I´ve th start again. I wonder, they are so very early in Your garden. Hi TT, Those two plants look lovely together. Anyway Beryl has a nice rooted cutting she's giving me when I know where to put it. Doesn't it have a lovely scent ? Beautiful TT, Would make a wonderful bouquet if I was still a florist. That looks altogether dreamy, I can almost smell the wonderful scent, isnt nature absolutely fantastic! But I need to go a bit nearer to enjoy the scent..... Lol. Gorgeous, gone in my favourites. Hi Deida ~ Thank you..
loved the combination our lilic is not out yet the weather is still very cold and windy up here. The past few days have been cold and windy in most of England, but better sunnier weather forecast for this weekend...... whooopeee ! I couldn't find the label when looking the other day, but I'll try to ID it for you and then I'll put another comment here. Great combination, and a lovely picture. Seaburngirl... Sorry not sure on the ID of this clematis. I bought it with the label "Pixie", but I think it might have been labelled wrongly..
We love this photo, beautiful Lilac, one of our favourites and the Clematis blends in perfectly. Wow! !your garden is way ahead of ours here on the island, especially after a 'nasty Winter ( we escaped it TG) but Lilacs must be a favourite to all humans, then combine it with a white clematis, fabulous, congrats in order. Did U plan it, or was it just one of those lovely surprizes?? I did plan to grow these two on my archway, but the end result was even better than expected, so in that way it was a pleasant surprise ! I guess in BC you are a few weeks behind the British springtime ? yes Terratoonie I got there, What a stunner just planted a couple of wisterias under arches hope they will look as lovely as your's. I hope your wisterias flower well for you. This is beautiful. I am getting a lilac start from my brother this weekend. I like the clematis w/this. I think I will try your idea...gorgeous! What colour lilac does your brother have ? I've been thinking of getting a lilac - now I know I have to get a lilac! This is a lovely combination and thanks for the welcome. What do you put on the soil in the fall ? I hope you find a lilac for your garden. Such a pretty combination TT, i also am looking for a lilac we had to have a very old one cut down and i do miss it. Was yours a large flowered lilac ? What colour are you hoping to plant ? I think your display of Lilac and Clematis is lovely and wish I could smell the fragrance of your Lilac. I can add nothing but to agree with all the other comments. First time I've seen this photo - the flowers are lovely but I'm so glad I wasn't the only one who thought they saw a little face. Fairies are watching over Conker. Such beautiful flowers and colors! Lovely photo & color combo! Stunning combination TT, an the wonderful fragrance is a big bonus ! I love lilacs, planted three new babies this spring, not sure what colors they will be as the label just said "assorted." I hope I get one in this same color though, it really is lovely. I may just have to follow your lead with the clematis. I have been thinking about a clematis and this is a wonderful combination. I hope your lilacs turn out to be pretty colours . Such a lovely combination...and isn't the smell of lilac in the spring sun just gorgeous! I'm commenting again Tt:-) Do you know which lilac it is? Is that the Korean one, dwarfish? A few years ago, when walking to the shops, I used to pass by the "parent" lilac shrub in a front garden. Eventually I plucked up the courage to ask the house owners if could take some cuttings. They have since moved, but I have their cutting doing well..... so... yes.. I reckon the prettiest for a small space....because I went to so much effort to get my lilac. I'll add this pic to GoYpedia Small Garden ideas. A very beautiful,natural and stunning combination of flower arrangement.I want to add this to my wish list. Being behind in my never ending task of catch-up has it's perks when I can see picture like this one while it is a bit bleak outside!! new to the site and looking at this in December and this transported me back to summer, what a gorgeous combination. I have no sense of smell so the scent of the garden is lost to me, but i can imagine they smell as beautiful as they look. That's a pity you have no sense of smell.